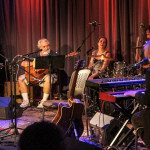 Songwriter, singer and multi-instrumentalist Emitt Rhodes has long been a legendary figure among those who take their pop music seriously. Though the albums he made between 1969 and 1973, as leader of the Merry Go Round and as a solo artist, were largely overlooked in their day, the decades since have seen his fan base grow incrementally through word of mouth. 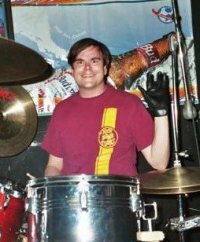 At the time the LA Beat interviewed Rhodes in 2012, he had just made some new music, which had been promptly withdrawn from the marketplace due to legal hassles with his producer, and he left the impression of someone who had been thoroughly burned by the business of music. 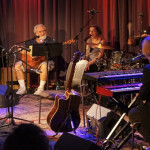 As such, his return to the performing stage at the Grammy Museum last week, one of two events scheduled to promote his new album Rainbow Ends, was a treat to behold. Unfortunately, the man himself was struck by the flu and completely unable to sing when it came time for the musical portion of the evening. 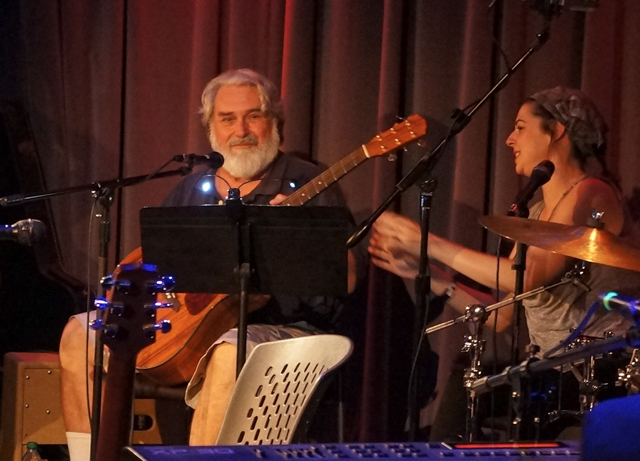 But still, the experience of watching Rhodes play guitar on his own material on an LA stage for the first time in about 45 years was heartwarming. Rhodes’ producer and collaborator on Rainbow Ends, Chris Price, capably took over vocal duties and led the band through a selection of old and new material, capped by the brilliant “Fresh As A Daisy” from Rhodes’ first solo album. 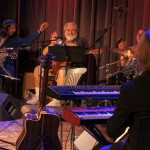 It was a warm, joyful performance, one that showed a lot of love and care from the musicians, who all seemed thrilled to be part of Rhodes’ resurgence. But the biggest smile on the entire stage was Rhodes’ own. The brief set was preceded by a Q&A with Rhodes, Price and LA Times writer Steve Hochman. 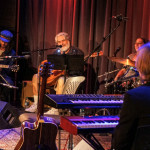 Rhodes seemed a little uncomfortable in the setting, but answered graciously and did let a few revealing details slip, the most poignant being the reason for his four decade plus absence from the music scene – “I didn’t think anybody cared.” And as he said it, you could tell he was looking out at the sold-out room, maybe momentarily grateful to have been proven wrong. Rainbow Ends is available now and highly recommended. 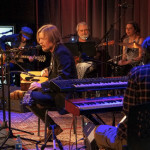 The band includes Chris Price, Roger Joseph Manning Jr, Jason Falkner, Taylor Locke, Fernando Perdomo and Joe Seiders, with guest appearances from Aimee Mann, Susanna Hoffs, Jon Brion, Nels Cline & Pat Sansone from Wilco, Bleu, Probyn Gregory & Nelson Bragg from the Brian Wilson Band, and others. 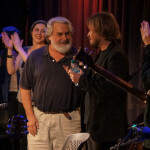 This entry was posted in Music and tagged chris price, Emitt Rhodes, grammy museum, merry go round. Bookmark the permalink. What a fun show that was. The look on Emitt’s face in that first photo says it all!